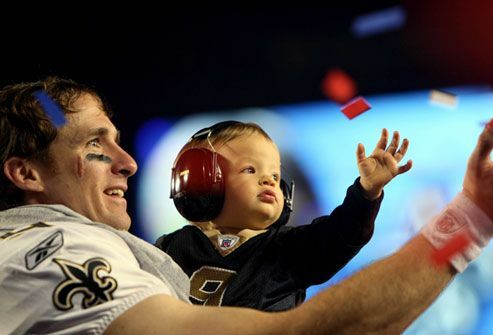 Birthmarks gain attention when there's a media blitz about someone with a visible mark, such as New Orleans Saints quarterback Drew Brees. News reports suggest that he was born with this birthmark on his right cheek, which doctors checked early on and found to be harmless. Folk wisdom calls such babies "touched by an angel," but a doctor's advice is best. 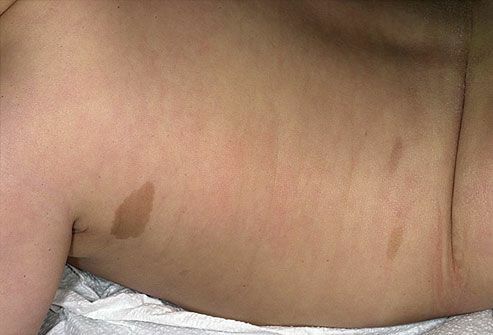 A birthmark is a colored mark on or under the skin that's present at birth or develops shortly after birth.Some birthmarks fade with time; others become more pronounced. Birthmarks may be caused by extra pigment-producing cells in the skin or by blood vessels that do not grow normally. Most birthmarks are painless and harmless. In rare cases, they can cause complications or are associated with other conditions. All birthmarks should be checked by a doctor. 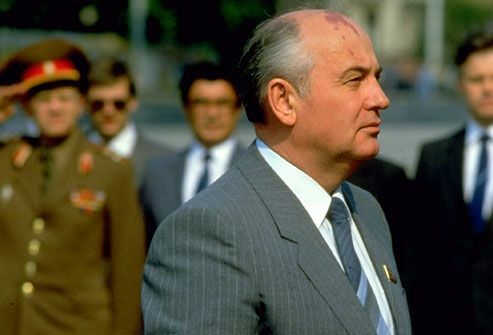 Seen here is former Soviet President Mikhail Gorbachev, who has a port wine stain on his forehead. Salmon patches are nests of blood vessels that appear as small, pink, flat marks on the skin. They occur in one-third of newborn babies. Salmon patches can appear on the back of the neck ("stork bite"), between the eyes ("angel's kiss"), or on the forehead, nose, upper lip, or eyelids. 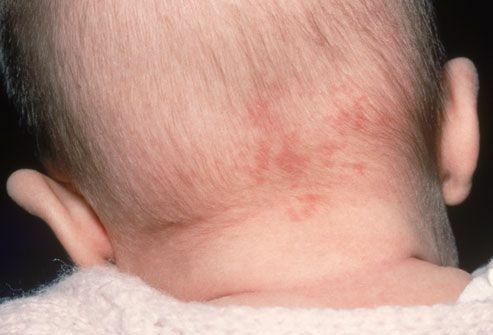 Some fade as baby grows, but patches on the back of the neck usually don't go away. Salmon patches require no treatment. 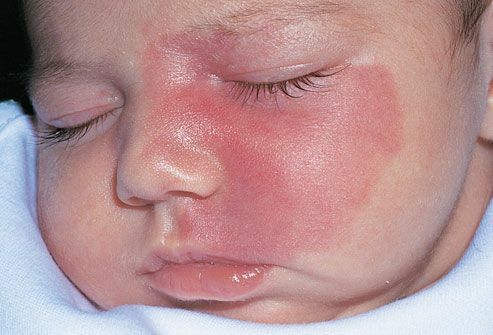 A port wine stain begins as a flat, pinkish-red mark at birth and gradually becomes darker and reddish-purple with age. Most will get bigger and thicker, too. Port wine stains are caused by dilated blood capillaries and occur in about three out of every 1,000 babies. Those on the eyelid may increase the risk of glaucoma. Port wine stains may be a sign of other disorders, but usually not. Treatment includes laser therapy, oral prednisone, skin grafts, and masking makeup. Mongolian spots are flat, smooth marks that are present from birth. Frequently found on the buttocks or lower back, they're typically blue, but can also be bluish gray, bluish black, or brown. They may resemble a bruise. 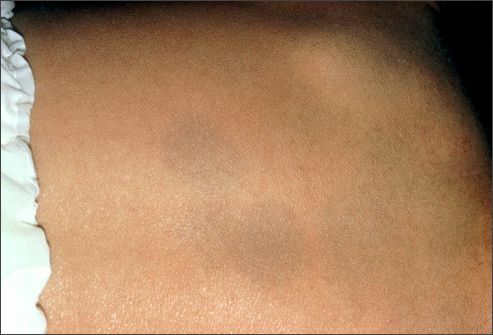 Mongolian spots are most common on darker-skinned babies. They usually fade by school age, but may never disappear entirely. No treatment is required. Cafe-au-lait spots are smooth and oval and range in color from light to medium brown, which is how they got their name, "coffee with milk" in French. They're typically found on the torso, buttocks, and legs. Cafe-au-lait spots may get bigger and darker with age, but are generally not considered a problem. However, having several spots larger than a quarter is linked with neurofibromatosis and the rare McCune-Albright syndrome. Consult a doctor if your child has several spots. Hemangiomas are a collection of small, closely packed blood vessels. 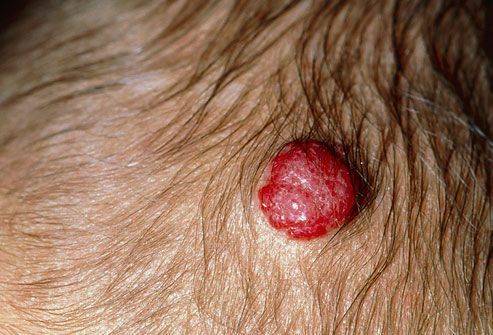 Strawberry hemangiomas occur on the surface of the skin, usually on the face, scalp, back, or chest. They may be red or purple and are often raised, with sharp borders. These occur in 2 of every 100 babies born. Strawberry hemangiomas usually develop a few weeks after birth. They grow rapidly through the first year before disappearing around age 9. Some slight discoloration or puckering of the skin may remain at the site. No treatment is required, but when they develop near the eye or mouth, or in a location that can bleed or become infected, they may need to be treated or removed. Present at birth, deeper cavernous hemangiomas are just under the skin and appear as a bluish spongy mass of tissue filled with blood. If they're deep enough, the overlying skin may look normal. 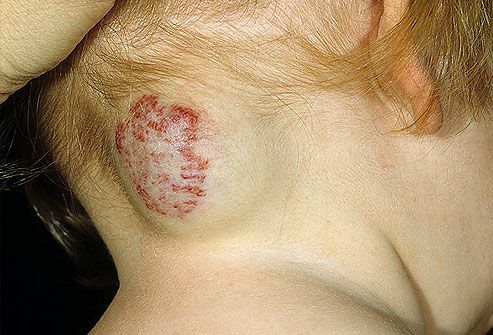 Cavernous hemangiomas typically appear on the head or neck. Most disappear by puberty. A combination of cavernous and strawberry hemangioma can occur. Venous malformations are caused by abnormally formed, dilated veins. Although present at birth, they may not become apparent until later in childhood or adulthood. Venous malformations appear in 1% to 4% of babies. They are often found on the jaw, cheek, tongue, and lips. They may also appear on other areas of the body. They will continue to grow slowly, and they don't shrink with time. Treatment -- often sclerotherapy or surgery -- may be necessary for pain or impaired function. 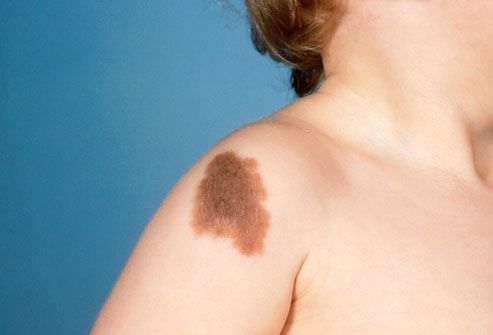 Congenital nevi are moles that appear at birth. The surface may be flat, raised, or bumpy. These moles can grow anywhere on the body and vary in size from less than an inch to over 8 inches. Congenital nevi occur in 1% of newborns. Most moles are not dangerous. But congenital nevi, especially large ones, have an increased risk of developing into melanoma, the deadliest type of skin cancer. All moles should be monitored for changes. (3) Biophoto Associates / Photo Researchers, Inc.
(4) “Color Atlas of Pediatric Dermatology”; Samuel Weinberg, Neil S. Prose, Leonard Kristal; Copyright 2888, 1998, 1990, 1975, by the McGraw-Hill Companies, Inc. All rights reserved. (6) Copyright © 2007 Interactive Medical Media LLC, All rights reserved. (7) Dr P. Marazzi / Photo Researchers, Inc.
(8) Copyright © 2007 Interactive Medical Media LLC, All rights reserved. (9) “Color Atlas of Pediatric Dermatology”; Samuel Weinberg, Neil S. Prose, Leonard Kristal; Copyright 2888, 1998, 1990, 1975, by the McGraw-Hill Companies, Inc. All rights reserved. (10) Copyright © Bart's Medical Library / Phototake -- All rights reserved. Children’s Specialists of San Diego website: “Congenital Pigmented Moles (Congenital Nevi). HealthyChildren.org: "Your Newborn's Skin: Birthmarks & Rashes." American Academy of Dermatology: "Red, white, and brown: Defining characteristics of common birthmarks will determine type and timing of treatment."